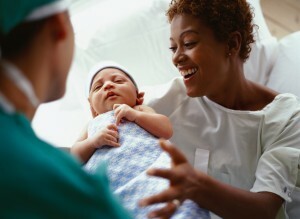 Newborns, as they are welcomed to the world, have a lot of adjustments to make from the moment they are born. At the moment of their birth, they undertake a lot of physiologic changes. From an comfortable environment full of warmth and dark liquid, to a chilly, limitless, brightly lit, gravity based outside world. According to Adele Pillitteri, how well the newborn makes major adjustments such as initial respirations depends on his or her genetic composition, the competency of the recent intrauterine environment, the care received during the labor and birth period, and the care received during the newborn or neonatal period—from birth through the first 28 days of life. The nurse has a distinctive chance of closely observing and providing care for the newborn infant after delivery. Because the newborn infant is helpless at this period of time, his needs must be attended primarily by nursing personnel. Many nursing assessments and evaluations are carried out for the health of the infant. Once the infant is delivered, his head is held slightly downward for a few seconds to encourage drainage of mucus and fluid. It can also be done by using bulb syringe to the mouth as soon as the head is delivered. The infant’s mouth is suctioned first and then his nose.Never stimulate a baby to cry unless secretions have been drained out. The infant’s face is wiped thoroughly clean. If the infant doesn’t breathe spontaneously, he should be stimulated to cry by slapping his heels, lightly tapping the buttocks, and/or rubbing his back gently. Place a head cap to conserve heat especially if they are in an open crib. All nursing care should be accomplished quickly as possible to minimize exposure of the infant. Chilling will increase the body’s need for oxygen. Newborn suffers large losses of heat because he is wet at birth, the delivery room is cold he does not have enough adipose tissues and does not know how to shiver. Identify the Infant After Delivery. The infant must be properly identified before leaving the delivery room. An identification (ID) band is placed on the infant’s wrist and leg. An identical band matching the infant’s band is placed on the mother’s wrist. Each facility has its own instant identification method. In some facilities, the infant’s footprints or palm prints placed next to the mother’s thumb print. This should begin as soon after delivery as possible so as to initiate the process of attraction and response between the newborn and the parents. In the delivery room as soon as the infant is dry and identified, he should be given to the parents. The infant is more alert during the first hours (more or less four) after birth than in the successive hours. This is done at one minute after birth to resolve the general condition and then at 5 minutes to determine how well the newborn is adjusting to extra-uterine life. Assessment includes color, heart rate, reflex irritability, muscle tone and respiratory effort. 0-3 points indicate that the baby is in serious danger and need immediate resuscitation. 4-6 points indicate that the baby’s condition is safeguarded and may need more extensive clearing of the airway and supplementary oxygen. 7-10 points are considered good and in the best possible health. These are interventions that are to be done after the first full breastfeed. Washing must be postponed by at least 6 hours as this will hinder the crawling reflex.